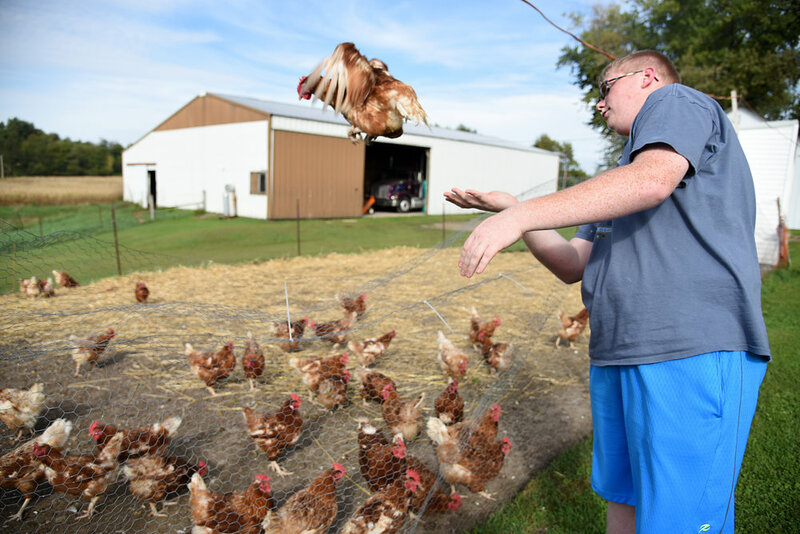 Shad Hanson, 17, holds a rescue chicken, Gordenia, at his family's farm outside of Juda Sept. 23, 2015. Hanson, who has had chickens since he was six, is referred to as "egg man" or "chicken boy" by his friends. Leanne and John Namio, of Freeport, share a dance during the Senior Citizen Prom at Monroe High School May 6, 2017. The Namios enjoy dancing and often go to dances at Turner Hall which is how they found out about the prom. The two have been married for 47 years. 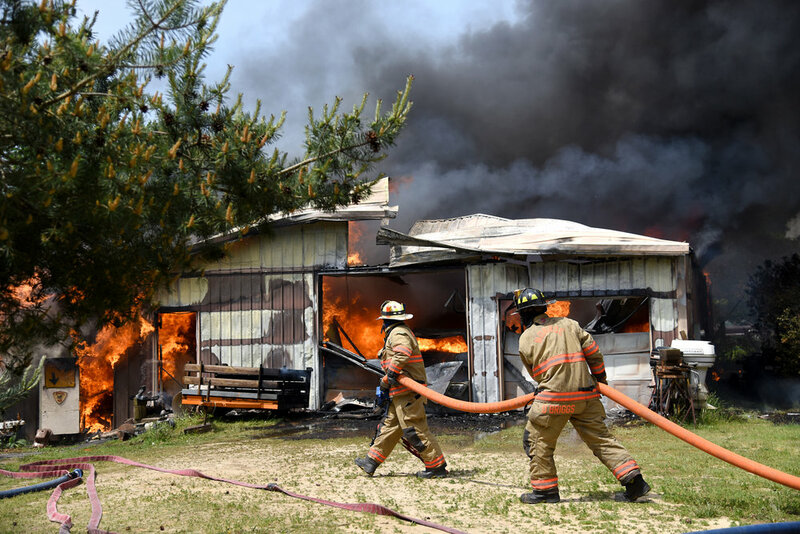 Monroe firefighters work to extinguish a fire that destroyed a storage shed on Pond View Road May 22, 2016. The shed was fully engulfed when firefighters arrived. Owner George Mau said he has owned the building since 1991 and used it to store collectibles he has been accumulating for almost 60 years. 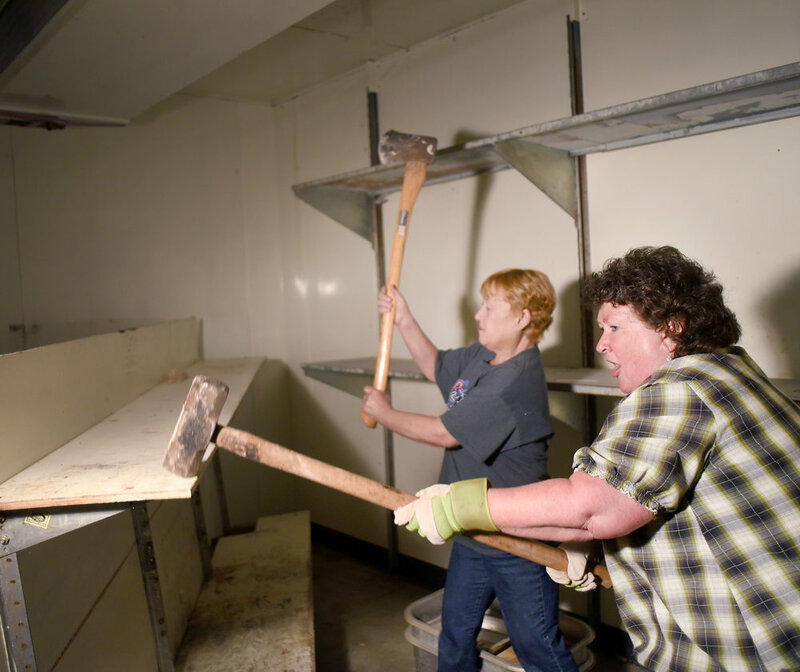 Laurie Hanson, of Argyle, and Muffy Rhyner, of Lake Geneva, try to break apart an old shelf during the renovation of Belle's Argyle Grocery on April 21, 2016. Dolores Marti, 87, walks away while video camera tripods block some of the foreground after her hearing at the Green County Justice Center August 19, 2016. Over 50 cats were seized from Marti's home alive, and 46 were found dead, of which 35 kittens and 6 adult cats were found in a freezer. Malaki Cooter, 9, jumps into a pile of snow while his brother, Kayden Cooter, 6, tries to drive a remote controlled car on the sidewalk outside their home in Monroe Dec. 11, 2016. The brothers were enjoying the snow and made several snow angels. 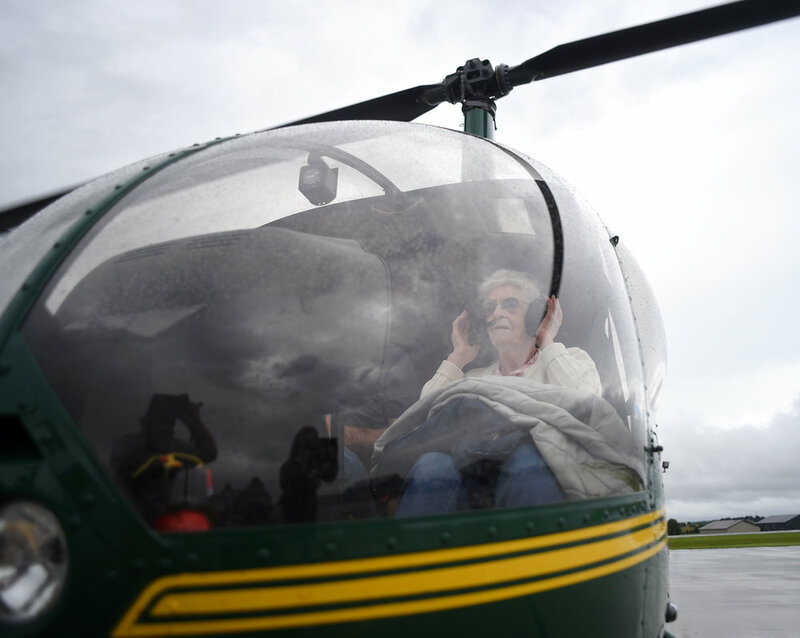 Gertie Goecks adjusts her headphones after getting into a helicopter from Redington Farms in Illinois at the Monroe Airport Sept. 10, 2016. Goecks was diagnosed with dementia earlier this year and moved to Azura Memory Care over Memorial Day Weekend. 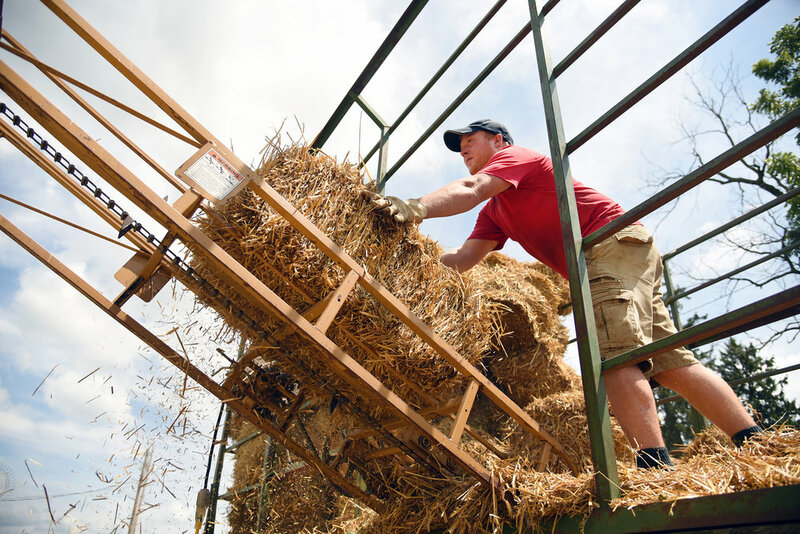 Scott Timm loads baled wheat straw at his family's farm outside of Monroe July 27, 2016. Timm works full time at his family's farm and owns his own seed company. Caden Creuzer, 9, holds a fish he caught while fishing with his summer school class at Lake Montesian in Monticello June 24, 2016. Creuzer, who goes to Abraham Lincoln Elementary, likes to fish with his uncle and catfish are his favorite to catch. Monroe High School students console each other during a candlelight vigil for three students who died in a car crash, at the Courthouse Feb. 11, 2017. From left, Dianne Whitney, Gloria Blaser, Deb Thompson, LouAnn Hanson and Kathy Whitaker jam with the Junction Jammers at the Junction House on March 9, 2016. American Legion members Jim Moser, Lucian Lemak, Bill Haffele, Alvie Riese, and Al Buri shoot during the Memorial Day Ceremony at the Cemetery May 30, 2016. 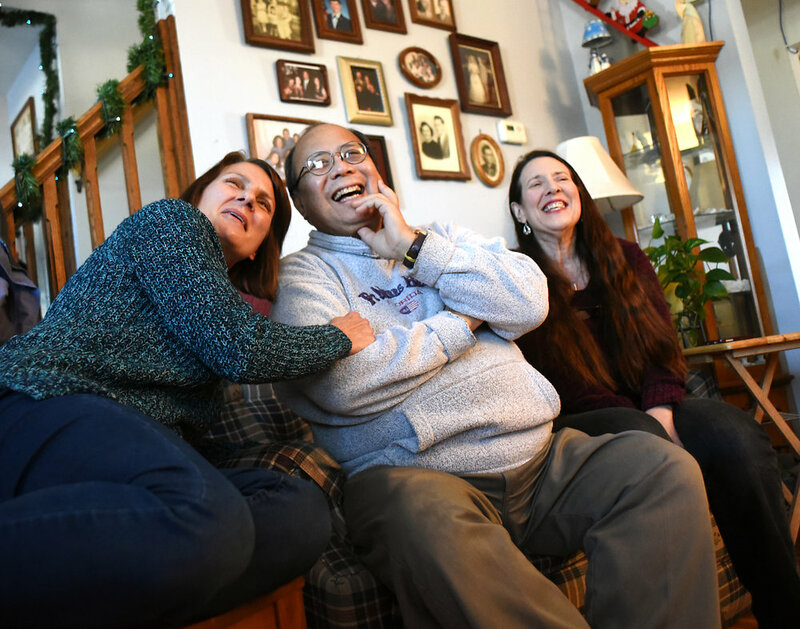 Christie Huber, Manny Bautista and his fiance, Laurie Athey, talk about their story in Bautista and Athey's home on Jan. 4, 2016. When Bautista, who has stage four kidney disease, posted on Facebook he was in need of a kidney transplant, Huber decided she wanted to be the one to donate to him. Bentley Keller, 6, reacts after being bit while feeding a pilgrim goose next to Harmony Hawkins-Grinnell, of Juda, at a petting zoo at the Super Cows Kickoff on the the Square June 4, 2016. "It didn't hurt though," Keller said. Nine-year-old Alivia Henning, who has autism, lays on her couch with her cat, Elsa, while playing on a cell phone at her home Sept. 22, 2016.